Charlotte Brontë (/ˈbrɒnti/, commonly /-teɪ/; 21 April 1816 – 31 March 1855) was an English novelist and poet, the eldest of the three Brontë sisters who survived into adulthood and whose novels became classics of English literature. She enlisted in school at Roe Head in January 1831, aged 14 years. She left the year after to teach her sisters, Emily and Anne, at home, returning in 1835 as a governess. In 1839 she undertook the role as governess for the Sidgwick family, but left after a few months to return to Haworth where the sisters opened a school, but failed to attract pupils. Instead they turned to writing and they each first published in 1846 under the pseudonyms of Currer, Ellis and Acton Bell. Her first novel The Professor was rejected by publishers, her second novel Jane Eyre was published in 1847. The sisters admitted to their Bell pseudonyms in 1848, and by the following year were celebrated in London literary circles. Charlotte Brontë was born on 21 April 1816 in Market Street Thornton, west of Bradford in the West Riding of Yorkshire, the third of the six children of Maria (née Branwell) and Patrick Brontë (formerly surnamed Brunty), an Irish Anglican clergyman. In 1820 her family moved a few miles to the village of Haworth, where her father had been appointed perpetual curate of St Michael and All Angels Church. Maria died of cancer on 15 September 1821, leaving five daughters, Maria, Elizabeth, Charlotte, Emily and Anne, and a son, Branwell, to be taken care of by her sister, Elizabeth Branwell. In August 1824, Patrick sent Charlotte, Emily, Maria and Elizabeth to the Clergy Daughters' School at Cowan Bridge in Lancashire. Charlotte maintained that the school's poor conditions permanently affected her health and physical development, and hastened the deaths of Maria (born 1814) and Elizabeth (born 1815), who both died of tuberculosis in June 1825. After the deaths of his older daughters, Patrick removed Charlotte and Emily from the school. Charlotte used the school as the basis for Lowood School in Jane Eyre. At home in Haworth Parsonage, Brontë acted as "the motherly friend and guardian of her younger sisters". Brontë wrote her first known poem at the age of 13 in 1829, and was to go on to write more than 200 poems in the course of her life. Many of her poems were "published" in their homemade magazine Branwell's Blackwood's Magazine, and concerned the fictional Glass Town Confederacy. She and her surviving siblings – Branwell, Emily and Anne – created their own fictional worlds, and began chronicling the lives and struggles of the inhabitants of their imaginary kingdoms. Charlotte and Branwell wrote Byronic stories about their jointly imagined country, Angria, and Emily and Anne wrote articles and poems about Gondal. The sagas they created were episodic and elaborate, and they exist in incomplete manuscripts, some of which have been published as juvenilia. They provided them with an obsessive interest during childhood and early adolescence, which prepared them for literary vocations in adulthood. 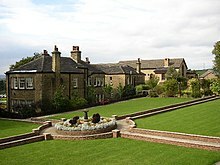 Between 1831 and 1832, Brontë continued her education at Roe Head in Mirfield, where she met her lifelong friends and correspondents Ellen Nussey and Mary Taylor. In 1833 she wrote a novella, The Green Dwarf, using the name Wellesley. Around about 1833, her stories shifted from tales of the supernatural to more realistic stories. She returned to Roe Head as a teacher from 1835 to 1838. Unhappy and lonely as a teacher at Roe Head, Brontë took out her sorrows in poetry, writing a series of melancholic poems. In "We wove a Web in Childhood" written in December 1835, Brontë drew a sharp contrast between her miserable life as a teacher and the vivid imaginary worlds she and her siblings had created. In another poem "Morning was its freshness still" written at the same time, Brontë wrote "Tis bitter sometimes to recall/Illusions once deemed fair". Many of her poems concerned the imaginary world of Angria, often concerning Byronic heroes, and in December 1836 she wrote to the Poet Laureate Robert Southey asking him for encouragement of her career as a poet. Southey replied, famously, that "Literature cannot be the business of a woman's life, and it ought not to be. The more she is engaged in her proper duties, the less leisure will she have for it even as an accomplishment and a recreation." This advice she respected, but did not heed. In 1839 she took up the first of many positions as governess to families in Yorkshire, a career she pursued until 1841. In particular, from May to July 1839 she was employed by the Sidgwick family at their summer residence, Stone Gappe, in Lothersdale, where one of her charges was John Benson Sidgwick (1835–1927), an unruly child who on one occasion threw a Bible at Charlotte, an incident that may have been the inspiration for a part of the opening chapter of Jane Eyre in which John Reed throws a book at the young Jane. Brontë did not enjoy her work as a governess, noting her employers treated her almost as a slave, constantly humiliating her. Brontë was of slight build and was less than five feet tall. In 1842 Charlotte and Emily travelled to Brussels to enrol at the boarding school run by Constantin Héger (1809–1896) and his wife Claire Zoé Parent Héger (1804–1887). During her time in Brussels, Brontë, who favoured the Protestant ideal of an individual in direct contact with God, objected to the stern Catholicism of Madame Héger, which she considered a tyrannical religion that enforced conformity and submission to the Pope. In return for board and tuition Charlotte taught English and Emily taught music. Their time at the school was cut short when their aunt Elizabeth Branwell, who had joined the family in Haworth to look after the children after their mother's death, died of internal obstruction in October 1842. Charlotte returned alone to Brussels in January 1843 to take up a teaching post at the school. Her second stay was not happy: she was homesick and deeply attached to Constantin Héger. She returned to Haworth in January 1844 and used the time spent in Brussels as the inspiration for some of the events in The Professor and Villette. Averse to personal publicity, we veiled our own names under those of Currer, Ellis and Acton Bell; the ambiguous choice being dictated by a sort of conscientious scruple at assuming Christian names positively masculine, while we did not like to declare ourselves women, because – without at that time suspecting that our mode of writing and thinking was not what is called "feminine" – we had a vague impression that authoresses are liable to be looked on with prejudice; we had noticed how critics sometimes use for their chastisement the weapon of personality, and for their reward, a flattery, which is not true praise. Although only two copies of the collection of poems were sold, the sisters continued writing for publication and began their first novels, continuing to use their noms de plume when sending manuscripts to potential publishers. Brontë's first manuscript, The Professor, did not secure a publisher, although she was heartened by an encouraging response from Smith, Elder & Co. of Cornhill, who expressed an interest in any longer works Currer Bell might wish to send. Brontë responded by finishing and sending a second manuscript in August 1847. Six weeks later, Jane Eyre was published. It tells the story of a plain governess, Jane, who, after difficulties in her early life, falls in love with her employer, Mr Rochester. They marry, but only after Rochester's insane first wife, of whom Jane initially has no knowledge, dies in a dramatic house fire. The book's style was innovative, combining naturalism with gothic melodrama, and broke new ground in being written from an intensely evoked first-person female perspective. Brontë believed art was most convincing when based on personal experience; in Jane Eyre she transformed the experience into a novel with universal appeal. Jane Eyre had immediate commercial success and initially received favourable reviews. G. H. Lewes wrote that it was "an utterance from the depths of a struggling, suffering, much-enduring spirit", and declared that it consisted of "suspiria de profundis!" (sighs from the depths). Speculation about the identity and gender of the mysterious Currer Bell heightened with the publication of Wuthering Heights by Ellis Bell (Emily) and Agnes Grey by Acton Bell (Anne). Accompanying the speculation was a change in the critical reaction to Brontë's work, as accusations were made that the writing was "coarse", a judgement more readily made once it was suspected that Currer Bell was a woman. However, sales of Jane Eyre continued to be strong and may even have increased as a result of the novel developing a reputation as an "improper" book. A talented amateur artist, Brontë personally did the drawings for the second edition of Jane Eyre and in the summer of 1834 two of her paintings were shown at an exhibition by the Royal Northern Society for the Encouragement of the Fine Arts in Leeds. In 1848 Brontë began work on the manuscript of her second novel, Shirley. It was only partially completed when the Brontë family suffered the deaths of three of its members within eight months. In September 1848 Branwell died of chronic bronchitis and marasmus, exacerbated by heavy drinking, although Brontë believed that his death was due to tuberculosis. Branwell may have had a laudanum addiction. Emily became seriously ill shortly after his funeral and died of pulmonary tuberculosis in December 1848. Anne died of the same disease in May 1849. Brontë was unable to write at this time. After Anne's death Brontë resumed writing as a way of dealing with her grief, and Shirley, which deals with themes of industrial unrest and the role of women in society, was published in October 1849. Unlike Jane Eyre, which is written in the first person, Shirley is written in the third person and lacks the emotional immediacy of her first novel, and reviewers found it less shocking. Brontë, as her late sister's heir, suppressed the republication of Anne's second novel, The Tenant of Wildfell Hall, an action which had a deleterious effect on Anne's popularity as a novelist and has remained controversial among the sisters' biographers ever since. 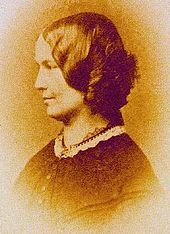 Disputed photograph taken about 1855; sources are in disagreement over whether this image is of Brontë or of her friend, Ellen Nussey. ... two gentlemen come in, leading a tiny, delicate, serious, little lady, with fair straight hair and steady eyes. She may be a little over thirty; she is dressed in a little barège dress with a pattern of faint green moss. She enters in mittens, in silence, in seriousness; our hearts are beating with wild excitement. This then is the authoress, the unknown power whose books have set all London talking, reading, speculating; some people even say our father wrote the books – the wonderful books. ... The moment is so breathless that dinner comes as a relief to the solemnity of the occasion, and we all smile as my father stoops to offer his arm; for, genius though she may be, Miss Brontë can barely reach his elbow. My own personal impressions are that she is somewhat grave and stern, specially to forward little girls who wish to chatter. ... Everyone waited for the brilliant conversation which never began at all. Miss Brontë retired to the sofa in the study, and murmured a low word now and then to our kind governess ... the conversation grew dimmer and more dim, the ladies sat round still expectant, my father was too much perturbed by the gloom and the silence to be able to cope with it at all ... after Miss Brontë had left, I was surprised to see my father opening the front door with his hat on. He put his fingers to his lips, walked out into the darkness, and shut the door quietly behind him ... long afterwards ... Mrs Procter asked me if I knew what had happened. ... It was one of the dullest evenings [Mrs Procter] had ever spent in her life ... the ladies who had all come expecting so much delightful conversation, and the gloom and the constraint, and how finally, overwhelmed by the situation, my father had quietly left the room, left the house, and gone off to his club. Brontë's friendship with Elizabeth Gaskell, while not particularly close, was significant in that Gaskell wrote the first biography of Brontë after her death in 1855. Brontë's third novel, the last published in her lifetime, was Villette, which appeared in 1853. Its main themes include isolation, how such a condition can be borne, and the internal conflict brought about by social repression of individual desire. Its main character, Lucy Snowe, travels abroad to teach in a boarding school in the fictional town of Villette, where she encounters a culture and religion different from her own, and falls in love with a man (Paul Emanuel) whom she cannot marry. Her experiences result in a breakdown but eventually she achieves independence and fulfilment through running her own school. A substantial amount of the novel's dialogue is in the French language. Villette marked Brontë's return to writing from a first-person perspective (that of Lucy Snowe); the technique she had used in Jane Eyre. Another similarity to Jane Eyre lies in the use of aspects of her own life as inspiration for fictional events; in particular her reworking of the time she spent at the pensionnat in Brussels. Villette was acknowledged by critics of the day as a potent and sophisticated piece of writing although it was criticised for "coarseness" and for not being suitably "feminine" in its portrayal of Lucy's desires. Before the publication of Villette, Brontë received an expected proposal of marriage from Arthur Bell Nicholls, her father's curate, who had long been in love with her. She initially turned down his proposal and her father objected to the union at least partly because of Nicholls's poor financial status. Elizabeth Gaskell, who believed that marriage provided "clear and defined duties" that were beneficial for a woman, encouraged Brontë to consider the positive aspects of such a union and tried to use her contacts to engineer an improvement in Nicholls's finances. Brontë meanwhile was increasingly attracted to Nicholls and by January 1854 she had accepted his proposal. They gained the approval of her father by April and married in June. Her father Patrick had intended to give Charlotte away, but at the last minute decided he could not, and Charlotte had to make her way to the church without him. The married couple took their honeymoon in Banagher, County Offaly, Ireland. By all accounts, her marriage was a success and Brontë found herself very happy in a way that was new to her. 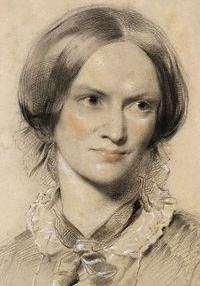 Brontë became pregnant soon after her wedding, but her health declined rapidly and, according to Gaskell, she was attacked by "sensations of perpetual nausea and ever-recurring faintness". She died, with her unborn child, on 31 March 1855, three weeks before her 39th birthday. Her death certificate gives the cause of death as tuberculosis, but biographers including Claire Harman suggest that she died from dehydration and malnourishment due to vomiting caused by severe morning sickness or hyperemesis gravidarum. Charlotte Brontë was buried in the family vault in the Church of St Michael and All Angels at Haworth. The Professor, the first novel Brontë had written, was published posthumously in 1857. The fragment of a new novel she had been writing in her last years has been twice completed by recent authors, the more famous version being Emma Brown: A Novel from the Unfinished Manuscript by Charlotte Brontë by Clare Boylan in 2003. Most of her writings about the imaginary country Angria have also been published since her death. In 2018, The New York Times published a belated obituary for her. The daughter of an Irish Anglican clergyman, Brontë was herself an Anglican. In a letter to her publisher, she claims to "love the Church of England. Her Ministers indeed, I do not regard as infallible personages, I have seen too much of them for that-but to the Establishment, with all her faults-the profane Athanasian Creed excluded-I am sincerely attached." If I could always live with you, and "daily" read the [B]ible with you, if your lips and mine could at the same time, drink the same draught from the same pure fountain of Mercy-I hope, I trust, I might one day become better, far better, than my evil wandering thoughts, my corrupt heart, cold to the spirit, and warm to the flesh will now permit me to be. Elizabeth Gaskell's biography The Life of Charlotte Brontë was published in 1857. It was an important step for a leading female novelist to write a biography of another, and Gaskell's approach was unusual in that, rather than analysing her subject's achievements, she concentrated on private details of Brontë's life, emphasising those aspects that countered the accusations of "coarseness" that had been levelled at her writing. The biography is frank in places, but omits details of Brontë's love for Héger, a married man, as being too much of an affront to contemporary morals and a likely source of distress to Brontë's father, widower, and friends. Mrs Gaskell also provided doubtful and inaccurate information about Patrick Brontë, claiming that he did not allow his children to eat meat. This is refuted by one of Emily Brontë's diary papers, in which she describes preparing meat and potatoes for dinner at the parsonage. It has been argued that Gaskell's approach transferred the focus of attention away from the 'difficult' novels, not just Brontë's, but all the sisters', and began a process of sanctification of their private lives. On 29 July 1913 The Times of London printed four letters Brontë had written to Constantin Héger after leaving Brussels in 1844. Written in French except for one postscript in English, the letters broke the prevailing image of Brontë as an angelic martyr to Christian and female duties that had been constructed by many biographers, beginning with Gaskell. The letters, which formed part of a larger and somewhat one-sided correspondence in which Héger frequently appears not to have replied, reveal that she had been in love with a married man, although they are complex and have been interpreted in numerous ways, including as an example of literary self-dramatisation and an expression of gratitude from a former pupil. In 1980 a commemorative plaque was unveiled at the Centre for Fine Arts, Brussels (BOZAR), on the site of the Madam Heger's school, in honour of Charlotte and Emily. In May 2017 the plaque was cleaned. Branwell Brontë, Painting of the 3 Brontë Sisters, l to r Anne, Emily and Charlotte Brontë. Branwell painted himself out of this portrait of his three sisters. National Portrait Gallery, London. The Green Dwarf, A Tale of the Perfect Tense was written in 1833 under the pseudonym Lord Charles Albert Florian Wellesley. It shows the influence of Walter Scott, and Brontë's modifications to her earlier gothic style have led Christine Alexander to comment that, in the work, "it is clear that Brontë was becoming tired of the gothic mode per se". Emma, by "Charlotte Brontë and Another Lady", published 1980; although this has been attributed to Elizabeth Goudge, the actual author was Constance Savery. ^ a b Fraser 2008, p. 261. ^ Cousin, John (1910). A Short Biographical Dictionary of English Literature. E.P. Dutton & Co.
^ a b Paddock & Rollyson 2003, p. 119. ^ Miller 2005, p. 5. ^ Paddock & Rollyson 2003, p. 8. ^ a b c Paddock & Rollyson 2003, p. 120. ^ Phillips-Evans 2012, pp. 260–261. ^ Paddock & Rollyson 2003, p. 18. ^ "Charlotte Brontë; Bronte Parsonage Museum". Bronte.org.uk. Retrieved 26 March 2016. ^ a b Paddock & Rollyson 2003, p. 29. ^ Lee, Colin (2004). "Currer, Frances Mary Richardson (1785–1861)". Oxford Dictionary of National Biography. 1. Oxford University Press. doi:10.1093/ref:odnb/6951. Retrieved 1 November 2014. ^ "Biographical Notice of Ellis And Acton Bell", from the preface to the 1910 edition of Wuthering Heights. ^ Miller 2002, p. 14. ^ Miller 2002, pp. 12–13. ^ a b Miller 2002, p. 13. ^ Miller 2002, p. 15. ^ Fraser 2008, p. 24. ^ Miller 2002, p. 17. ^ Miller 2002, p. 19. ^ The Novels of Anne Brontë. ^ "To walk invisible". Post. TLS. 30 September 2015. Archived from the original on 4 March 2016. Retrieved 26 March 2016. ^ "The Bronte Sisters – A True Likeness? – Photo of Charlotte Bronte". brontesisters.co.uk. Retrieved 6 September 2017. ^ Anne Isabella Thackeray Ritchie. Chapters from Some Memoirs. cited in Sutherland, James (ed.) The Oxford Book of Literary Anecdotes. OUP, 1975. ISBN 0-19-812139-3. ^ Reid Banks, L. (1977). Path to the Silent Country. Penguin. p. 113. ^ a b Miller 2002, p. 47. ^ Miller 2002, p. 52. ^ a b Paddock & Rollyson 2003, p. 19. ^ Miller 2002, p. 54. ^ Miller 2002, pp. 54–55. 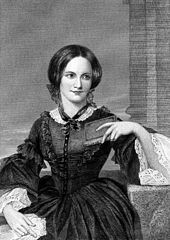 ^ "Being the Brontes – Charlotte Bronte's marriage with The Rev. Arthur Bell Nicholls". BBC. 26 March 2016. Retrieved 26 March 2016. ^ Alexander, Christine; Sellars, Jane (1995). The Art of the Brontës. Cambridge University Press. p. 402. ISBN 978-0-521-43248-1. ^ "Real life plot twists of famous authors". CNN. 25 September 2007. Retrieved 12 June 2013. ^ Dominus, Susan (8 March 2018). "Overlooked No More: Charlotte Brontë, Novelist Known for 'Jane Eyre'". The New York Times. ^ Griesinger, Emily (Autumn 2008). "Charlotte Bronte's Religion: Faith, Feminism, and Jane Eyre". Christianity and Literature. 58 (1): 29–59. doi:10.1177/014833310805800103. ^ a b Miller 2002, p. 57. ^ Lane 1953, pp. 178–83. ^ Miller 2002, pp. 57–58. ^ a b c Miller 2002, p. 109. ^ "A Plaque is Unveiled in Brussels to Commemorate the Stay of Charlotte and Emily Brontë at the Pensionnat Heger". Brontë Society Transactions. Taylor & Francis. 17 (5): 371–374. 1980. doi:10.1179/030977680796471592. ^ "Brontë Society plaque on Bozar gets a facelift". brusselsbronte.blogspot.co.uk. 23 May 2017. Retrieved 27 May 2018. ^ Shorter, Clement King (19 September 2013). "The Brontës Life and Letters: Being an Attempt to Present a Full and Final Record of the Lives of the Three Sisters, Charlotte, Emily and Anne Brontë". Cambridge University Press. Retrieved 2 February 2019 – via Google Books. ^ Alexander 1993, pp. 430–432. ^ "Review of Emma Brown by Charlotte Cory". The Independent. 13 September 2003. Archived from the original on 19 September 2011. Retrieved 12 June 2013. ^ Bronte, Charlotta and Another Lady. Emma. Moscow: Folio. 2001. 11. Alexander, Christine (March 1993). "'That Kingdom of Gloo': Charlotte Brontë, the Annuals and the Gothic". Nineteenth-Century Literature. 47 (4): 409–436. Fraser, Rebecca (2008). Charlotte Brontë: A Writer's Life (2 ed.). New York: Pegasus Books LLC. p. 261. ISBN 978-1-933648-88-0. Lane, Margaret (1953). The Brontë Story: a reconsideration of Mrs. Gaskell's Life of Charlotte Brontë. Miller, Lucasta (2002). The Brontë Myth. London: Vintage. ISBN 978-0-09-928714-8. Miller, Lucasta (2005). The Brontë Myth. New York: Anchor. ISBN 978-1400078356. Paddock, Lisa; Rollyson, Carl (2003). The Brontës A to Z. New York: Facts on File. ISBN 978-0-8160-4303-3. Phillips-Evans, James (2012). The Longcrofts: 500 Years of a British Family. Amazon. pp. 260–261. ISBN 978-1481020886. Potter, Dawn (Summer 2010). "Inventing Charlotte Brontë". The Sewanee Review. 118 (3): 393–399. Wikimedia Commons has media related to Charlotte Brontë.